It has been a good week so far, and I thought I would share that with you. For those of you that read the Mycroft Journals, the game that spawns that story happened last night. The games master, the other player and myself had a near 5 hour session wrapping up the current chapter, with an appropriately cinematic climax heavily influenced by Underworld: Rise of the Lycans, and (If I don’t miss my guess) Gods of Egypt, No spoilers because that you can read about in future Mycroft Journal posts. If you haven’t read them yet, then click on the subheading at the top of this page and have a browse through. So far, folks who read regularly are enjoying the story as much as I am enjoying playing the game, and writing it. The second piece of good news came after my weekly visit to the Onyx Path Monday Developers Blog. One of the titles I have been waiting for a year and a half is released this week! See details from their site, via the magic of “Press this”. V20 Lore of the Bloodlines will be awaiting you this Wednesday in PDF and physical book PoD versions on DriveThruRPG.com! 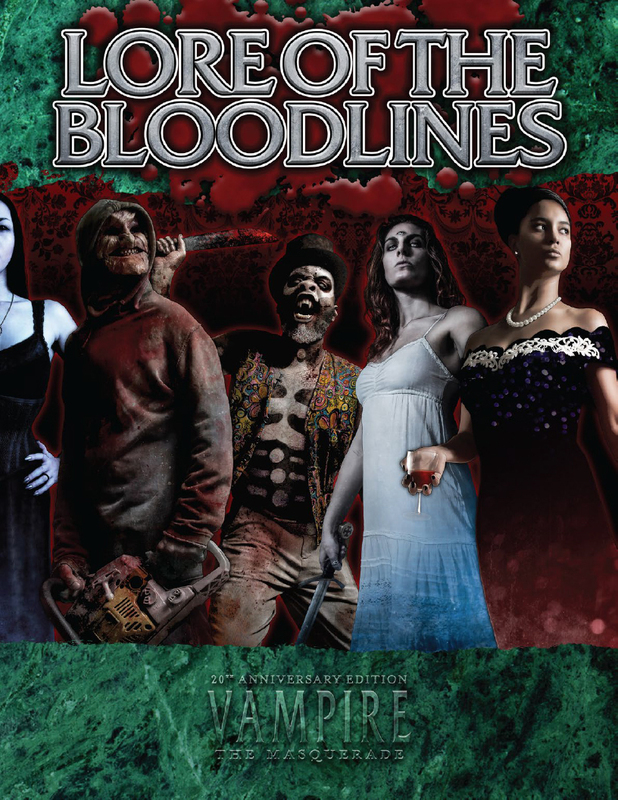 Lore of the Bloodlines is a single volume (created via Kickstarter) that revisits some of the bloodlines in Vampire: The Masquerade 20th Anniversary Edition, providing story hooks, character concepts, history, and bloodline-specific rules. The secrets of the Baali, Daughters of Cacophony, Gargoyles, Harbingers of Skulls, Kiasyd, Salubri, Samedi, and True Brujah are now yours. • The history, lore, and nightly practices of nine bloodlines, told from the perspective of the Kindred themselves. • New combo Disciplines, powers, Merits, Flaws, and other rules specific to each bloodline. • Revisions and updates of more classic Vampire: The Masquerade material to V20. As people are aware, I am a huge fan of Vampire V20, the game system. (Admittedly some of the books that have been released have some sloppy writing that should have been edited out before release, however, I forgive that as the system and world is fun). This book covers the rarest of the vampire clans in the world, giving more in depth background. Personally, I don’t think I would be totally interested in playing any of them, but I like having the lore so I can use them as a jack in the box plot device from time to time. Now, as I have a background in close reading, and I am a massive pedant, I noticed that the book is claiming a whopping 9 bloodlines within its covers, but only 8 are listed above. The likeliest would be Nagaraja, which is a type of Necromancer in the game. However, I am hoping Nictuku, as they are boogey men for the type of character I normally play. And in 20 years of playing the game I have come across very little information on them. Which is good as it allows my imagination to run riot and fill in the blanks. But it is sometimes nice to have a bit of information. Anyway, that’s all for just now. If this post gets one like (or more), I will do a full review on the book as soon as possible. Sorry, I just gave you more work to do! 🙂 But it seems very interesting! !